Cheap flights to Ireland: Prague-Dublin for €76! 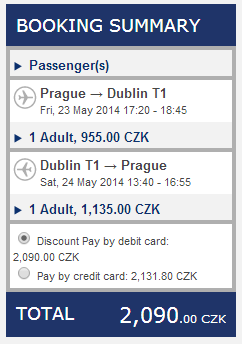 Ryanair started flying from Czech Republic to Ireland on 1st April 2014 and you can now buy tickets for great price. Return flights from Prague to Dublin are available from only €76 / 2090 CZK. Travel dates are mostly in May. Many other dates are available for slightly higher prices. « Cheap flights to Greece: Warsaw-Thessaloniki for €62!